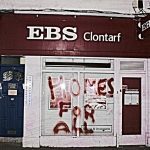 Over a night in December acts of vandalism were carried out in Dublin against banks and ATM’s. 3 banks had locks glued up, 2 banks had message of “Homes for all” sprayed across windows, and 3 ATM’s were glued up. These acts were carried out in conjunction with struggle for housing being waged across Ireland. These acts were but small acts of defiance and revolt against this prison society, to subvert the capitalist spectacle, if even only for a few hours. Actions like these expose the vulnerable spots of capitalism. Masked Garda threatening people with batons in the aftermath of the violent eviction carried out by thugs in Dublin last night. 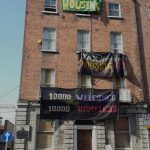 Pepper spray, dogs and batons were deployed, there were 5 or 6 arrests and four housing campaigners required hosptial visits from injuries received in the course of the eviction of the Frederick St occupation [which is the second recent occupation]. 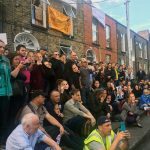 Yesterday [9/8/18] the housing activist occupation at 35 Summerhill Parade entered its third day. Approximately 100 people attended the ‘Leo’s Early Risers’* event yesterday evening to show solidarity and support to the local community and all those involved in the occupation. 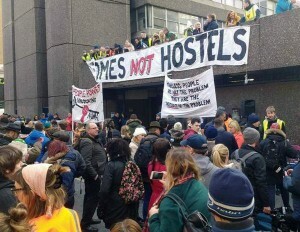 Speeches came from housing activists and residents in the local area to demand adequate and affordable homes for all and stress the need for direct action to take back housing from slum landlords – such as multi millionaire Pat O’Donnell who evicted over 120 people from five houses on Summerhill Parade in May – and all those who profit from the current housing crisis. 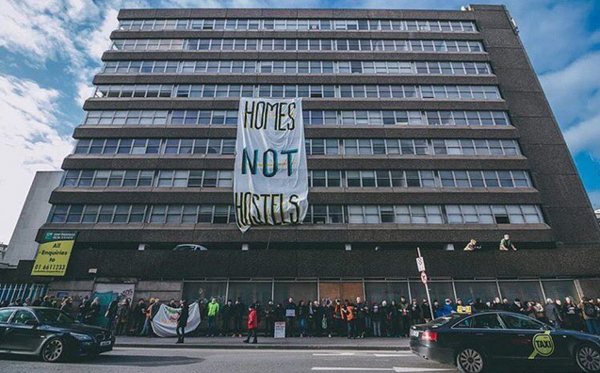 Home Sweet Home squatted Apollo House in Dublin on Thursday 15 December. This building is the former Department of Social Protection offices, which is now being used to house the homeless. Apollo House in Dublin was squatted on Thursday 15 December. This building is the former Department of Social Protection offices, which is now being used to house the homeless. 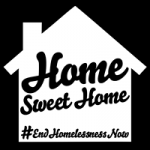 A high court judge yesterday granted an injunction that directs the Home Sweet Home occupiers of Apollo House to vacate the building by noon on January 11th. 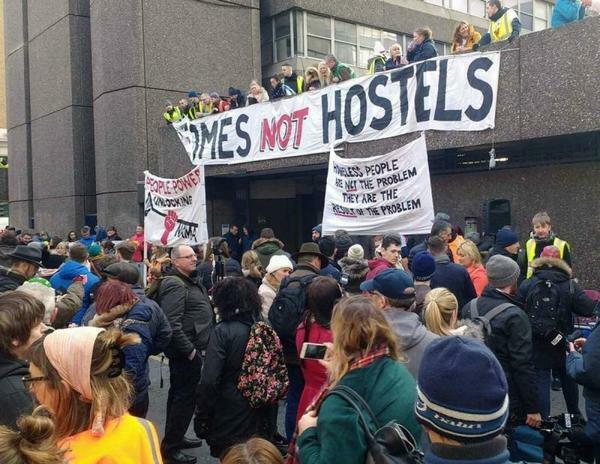 This means that the occupiers will remain in the building until after Christmas which is some good news but it still means that the State is quite willing to forcibly eject people from safe accommodation back out onto freezing streets or into unsafe, sub standard accommodation. This video was shot on the morning of the Apollo House injunction hearing at the High Court, 21st December. As well as footage from outside the courts on our way there we had earlier visited the sites of other occupied buildings evicted in the last 20 months. We discovered all of them were still vacant and in most cases no visible work at all had been done on them. 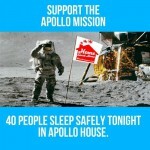 Apollo house is a NAMA building occupied to provide emergency accommodation for homeless people. 35-40 people have been accommodated there over the last couple of nights. As expected the judge granted the injunction, it will come into operation on January 11th.